More than 170 researchers, educators, farmers, and agricultural service providers attended the Northeast Cover Crops Council’s (NECCC) Annual Meeting at The Statler Hotel on November 8 for a day-long program featuring more than 40 speakers and an evening poster session. 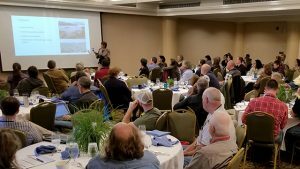 Speakers reported on the latest research and farmer-proven practices on a wide range of topics including techniques for establishing and terminating cover crops, their benefits, and how to get more farmers interested in cover cropping. Bianca Moebius-Clune (MS ’06, PhD ’09), Director of the USDA-NRCS Soil Health Division delivered the opening keynote address. Moebius-Clune was formerly a Senior Extension Associate in the Soil and Crop Sciences Section. “The great turnout we had is more evidence of the growing interest in using cover crops to prevent erosion, manage nutrients, suppress weeds, and increase both soil health and farm profits,” says Matt Ryan, assistant professor in the Soil and Crop Sciences Section and head of the Cornell Sustainable Cropping Systems Lab, who helped organize and hosted the meeting. The second day of the meeting featured a field tour of the cover crop demonstrations at the USDA-NRCS Big Flats Plant Materials Center, Big Flats, N.Y. The meeting was the first for the NECCC, whose mission is to support the successful implementation of cover crops to maximize economic, environmental, and social benefits. The group facilitates regional collaboration between farmers, researchers and the public to foster the exchange of information, inspiration, and outcome-based research, and serves as a central clearinghouse for cover crop research in the Northeast.